Quickly screen for residual pesticides in foods. This database is preregistered with calibration curve data* created with pesticide surrogates, as well as Scan/SIM and Scan/MRM analysis methods developed for simultaneous multicomponent analyses. Accurate peak identification and semi-quantitative analysis are achieved using the AART (Automatic Adjustment of Retention Times) function, even without analytical standards. 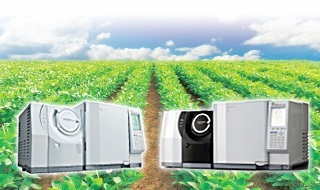 In addition, foods can be quickly screened for residual pesticides without allotting time to generate calibration curves, compound data settings, or the selection of columns and liners. Even when a highly selective analysis method is used, such as SIM or MRM, accurate detection and quantication of targets can be a problem due to co-extractants, contaminants, and background from sample matrix. Improve detection and quantitative accuracy by using the Twin Line MS system, which is equipped with two columns with complementary and dissimilar phases. Conduct analysis on either column without venting the MS to change columns. Peak detection may be difficult with column 1 due to the presence of co-eluting contaminants. Measuring the sample with column 2, which has a different separation pattern, enables separation of the contaminants and detection of the targets. During routine analysis, periodic evaluation of system controls are required to determine and maintain instrument stability. 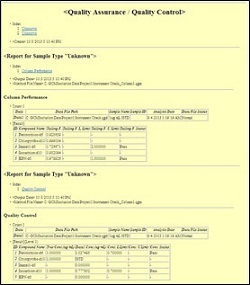 This database provides QA/QC methods using pesticide surrogates. These methods can be used to quickly check system status. This database includes report files and method files which contain data analysis parameters, and can be fully customized to meet specific laboratory requirements. In addition, all instrument configuration settings, analytical method conditions, and data processing parameters are included for each method. 1. Shimadzu makes no warranty regarding the accuracy of information included in the database or the usefulness of information obtained from using the database. 2. Be sure to perform tests using standards to confirm qualitative and quantitative information obtained with the given system. 3. 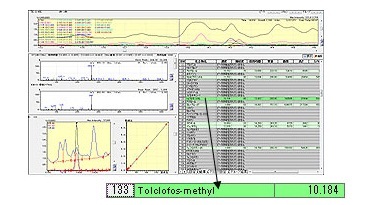 To reliably identify registered substances using this database, measure samples using the instrument parameters specified in the method template files included in the product.